The Bundle of Holding is offering eight tabletop horror products, with another two bundles scheduled later this month. If you're a fan of horror games, Halloween is a good time to be a gamer. Between new titles, re-releases, and occasional seasonal discount, you're incredibly likely to find something that matches your specific brand of terror. Tabletop gamers aren't an exception, as the latest Bundle of Holding is surely proving. The ebook website is offering not one, not two, but three pay-what-you-want bundles of role-playing horror this October, with the first entry covering eight games and supplements. The base bundle kicks off with Dread, a horror game that replaces the randomness of dice rolls with an unstable Jenga tower, decreasing your odds of survival over time. 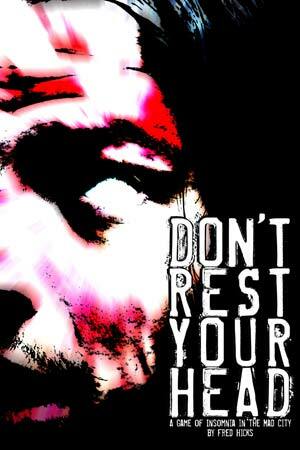 Next up is Don't Rest Your Head, featuring superpowered insomniacs who fight monsters and their own insanity across an otherworldly realm. Then there's Kingdom of Nothing, a game depicting the forgotten and homeless who confront terrifying creatures in the abandoned ruins of cities. Wrapping up the base bundle is Murderous Ghosts, a two-player game in which the protagonist must find an exit from a deadly ghost-infested basement. As with many pay-what-you-want bundles, the "Bundle of Nerves" includes additional products for those willing to pay above the average. For dropping more than the current average of $15, you'll be rewarded with Don't Rest Your Mind, the official supplement of DRYH. You'll also get The Demolished Ones, a tale of amnesiacs accused of murder, and Spookybeans, a morbidly light-hearted game in the spirit of Tim Burton. Finally, Bundle of Holding presents the never-before-published Murderous Ghosts supplement Northampton State Hospital, based on the real-world historical setting of the same name. If for some reason these games still aren't enough for your gaming group, just wait a little bit longer; Bundle of Holding will be introducing the remaining two sets in the coming weeks. What those bundles contain has yet to be revealed, but combined, they should make for some unsettling gaming marathons once Halloween finally rolls around.